I want to welcome you to my weekly appointment with extraordinary colleagues living and working in the world of culture and languages. You can see that today there is something different in the header. In fact, here with me today there are two special guests. Yes, you’ve heard it right. We have two guests instead of the usual featured one. 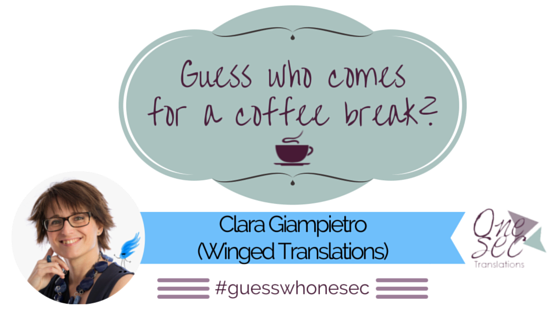 Welcome to my coffeece Clara and… Little Wing! I am so happy you made it! Thank you so much for coming! Thank you Clara for bringing Aletta with you. It is a real pleasure to meet you, darling! As I always say, we are going to talk over a cup of coffee (with milk, no sugar – for you, Clara. Here you are!) and a glass of milk – for our little guest – and find out more about the participants of this brand new interview. I met Clara last year during her Summer holidays in the Marche region – where I live, and I accompanied her through the little streets of Macerata as a sort of guide to the city centre. We had a lot of fun and since that moment on we have been chatting a lot and we have become friends. I went to Turin – her city – last month to attend the “IAPTing in Torino” organised by Victoria Principi and Elina Ilaria Nocera, and I took the most of that occasion by visiting Clara. I spent a couple of days with her and I had a walk around the city – I LOVE IT. I left a part of my heart there. Clara is a loyal friend. I think she is a sweet, stubborn, and strong woman. She is reliable and I owe her a lot – she knows why. I am sure you will like her just as much as I do. So… let’s start! And… The surprise is that Little Wing is going to answer some questions, too. Therefore, I am going to ask you both six sets plus a Bonus Qs section of questions covering your personal profile rather than the professional one. In particular, today, you are going to focus on the first three sets. On Thursday, you will answer the remainder of them. Ready? Clara is nodding. Little Wing, are you ready? I think it is a “yes”. Ok, go! ▷ Clara Maria Laura Giampietro. ▷ Aletta in Italian, Little Wing in English. ▷ I am an Italian professional translator. I translate technical, legal and marketing texts from English and Spanish into Italian for technology and industry clients. ▷ I’m a cloud wanderer. ▷ It depends on the context. ▷ I live near Turin. ▷ I live among the clouds. ▷ There’s no such thing as too much blue. ▷ I wanted to become a trapeze artist. I can say that I somehow realised my dream by becoming a trapeze artist of words. Like trapeze artists translators love the challenge of facing difficult work; they pay close attention to all the little details; they have to be talented, but they also have to work extremely hard and spend years training to perfect their skills. ▷ I wanted to become a dragon. ▷ Both: We love animals, and we have got six bug sticks. ▷ Coffee, with milk but no sugar. ▷ I usually wake up early, but I would honestly prefer to sleep a bit more. I find it hard to get out of bed in the morning, and I am more active in the evening. ▷ I love to wake up early with the birds, while everyone is still sleeping, and enjoy some “me” time. ▷ My Smartphone and Little Wing. ▷ Risotto alla Milanese (Saffron Risotto) and chocolate. ▷ Well, my specialty is… to forget what I am cooking. Just lucky I haven’t burned the kitchen yet! ▷ I love cooking, especially chocolate cakes, chocolate mousse and chocolate cookies. ▷ I only wear heels for working reasons or in special occasions. ▷ I don’t wear shoes at all. ▷ I am basically a lazy person, but I follow an exercise plan almost every morning for at least half an hour. I also love swimming. I feel at home in the water and it helps me clear the mind. No matter what is going on outside of the water, when I swim I can disconnect from everything. ▷ I am a sporty wing and I like doing a number of different activities, in particular dancing, swimming and ice-skating. • If you like them, which is your favourite board game? ▷ I prefer to play outside over playing at home, but on rainy days I like to play at Gioco dell’oca (Snakes and ladders). ▷ It depends on the language. In Italian I like everything by Italo Calvino, in Spanish The House of the Spirits by Isabel Allende, in English Through the Looking-Glass by Lewis Carroll, in Russian War and Peace by Leo Tolstoy. At the moment I am reading Meaningful – The story of ideas that fly by Bernadette Jiwa. ▷ My favourite book is The Story of a Seagull and the Cat Who Taught Her to Fly by Luis Sepúlveda. • Do you consider yourself a geek? ▷ I am more a nerd than a geek. • If you have a smartphone, Android, iOS, or Windows? • If you use social media, which is your favourite one? • Are you a gamer? Little Wing is having fun and I can see she wants to play, so it is time for us to go and spend some time with her. Don’t worry, readers! We will be back on Thursday and you will discover a lot more about our two new friends. Stay tuned! In the meanwhile, follow me and Clara to see what happens behind the scenes. Who’s Clara? ▷ Clara is a professional English and Spanish to Italian translator. Since 2004, she has been translating technical, law and marketing texts. She loves working for technology and industry clients, and her mission is to help them expand their business by making their words fly in Italian. You can visit her website Winged Translations or you can find her on LinkedIn, Pinterest, Facebook and Twitter. Who’s Aletta? ▷ Aletta aka Little Wing is a cloud wanderer, dragon lover and the creative dreamer behind the visuals of Winged Translations. Clara Giampietro, trapeze artist of words. I make your words fly in Italian. IL POST IN CUI TI RACCONTO (QUASI) TUTTO DELLE NOVITÀ IN ARRIVO – Clara Giampietro, trapeze artist of words. I make your words fly in Italian.